When the real estate market boomed a few years ago in Bay Area, many developers started to convert apartment complexes to condominiums. The high demand for real estate in Silicon Valley meant that selling condos was more profitable than renting them as apartments. Just to name a few, in 2006 the developers converted and put to bubbling real estate market - 176 condos in Cupertino Villas - 880 E Fremont Ave, Sunnyvale; 332 condos in Sierra Crest Villas - 610 Teatree Court, San Jose; 135 condos in Alta Mar Villas - 3695 Stevenson Blvd, Fremont; 248 condos in Baywood Villas - 3190 Red Cedar Terrace, Fremont; and 200 units in Crossroads - 450 Dempsey Rd, Milpitas. As the market for real estate has slowed so has the conversion trend. Now we started to see the reverse trend - converting condos into apartments building. Two years ago 121 condominiums in Skyline At Tamien Station development went to the market as rental condos for up to five years. The current rent for condo in Skyline At Tamien starts from $1,600 to $4,200. And now another San Jose downtown high-rise condo development failed to attract the buyer interest that developers had hoped. The brand new condos in 360 Residences are available for rent and most likely will seriously affect rental prices in downtown San Jose. 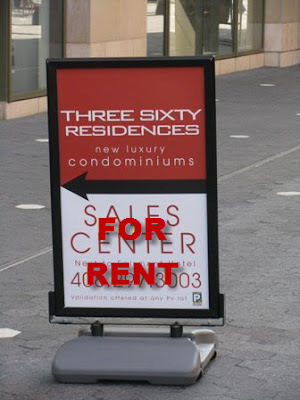 Three Sixty Residences conversion does not necessarily mean the other high rise projects like Axis or Plant 51 will convert to rental apartment complexes, but it definitely leaves a bad impression for potential homebuyers in San Jose downtown. How big was HOA in 360 Residences?